Born in Cleveland, Ohio, Jerry Willard’s first teacher was his father, Jeff Willard, an accomplished guitarist in his own right. The guitar pedagogue Sophocles Papas recognized Jerry’s talent and invited him to study in Washington, D.C. He also studied with guitarists Richard Lurie and Alirio Diaz, who developed his musical and technical approach to the guitar. He also worked with violinist Misha Mishakoff and cellist Warren Downs, who expanded his knowledge of musical interpretation. Mr. Willard is an accomplished player of all types of fretted instruments, including the arch-lute, the Renaissance lute, and the Baroque, nineteenth-century, and modern guitars. Well known as an ensemble player, Mr. Willard has performed with the Cleveland Orchestra, The New York Opera Company, The New York Consort of Viols, and The Queen’s Chamber Band. He has published many editions for guitar, including The Complete Lute Music of J. S. Bach and The Complete Works of Gaspar Sanz, both available through Music Sales Corporation. Mr. Willard records for Lyrichord Discs. 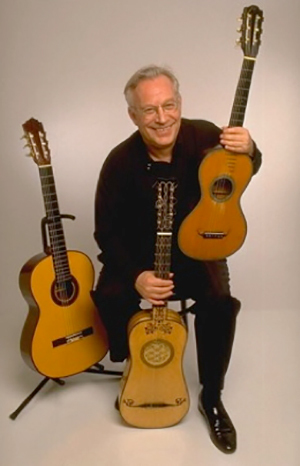 He has recorded music for arch-lute, Baroque Guitar, and Renaissance lute. He has just finished a recording of opera potpourris by Giuliani and Mertz on a Lacote guitar made in Paris in 1820. He resides in New York City and is on the faculty of the State University of New York at Stony Brook.